Tankless water heaters are a luxury appliance and not for everyone. The draw of a tankless water heater is that they don’t hold a tank of hot water. It merely heats water at the time of the demand. The number of people in the home and their habits will determine the size of a tankless water heater. Because it heats water only at the time of demand, a small tankless water heater only offers hot water to one faucet. If multiple people want to take showers, or if the washing machine or dishwasher is on, someone is going to end up being mighty cold. Larger tankless water heaters offer more water but are more expensive. Tankless water heaters require gas service because of the nature of the way they heat up water. It just needs too much draw too fast for an electric one to make sense unless it’s only for one or two people. The type of gas line in the home matters. The typical line for a regular water heater tank is too small for a tankless water heater. 200-220k BTU's for average, a tankless uses 180-199k. When a home has a gas dryer, a gas furnace, and a gas range, the tankless water heater will have to ‘share’ the gas with them, and the smaller line will come up short. A larger gas line, or high-pressure gas line, will solve this problem. The water quality matters. Phoenix water is hard enough to affect the performance, so unless the home has a water softener, it’s going to be a problem. Because the burners for a tankless water heater are high-powered, they require special venting, both exhaust, and intake vents in a smaller space. 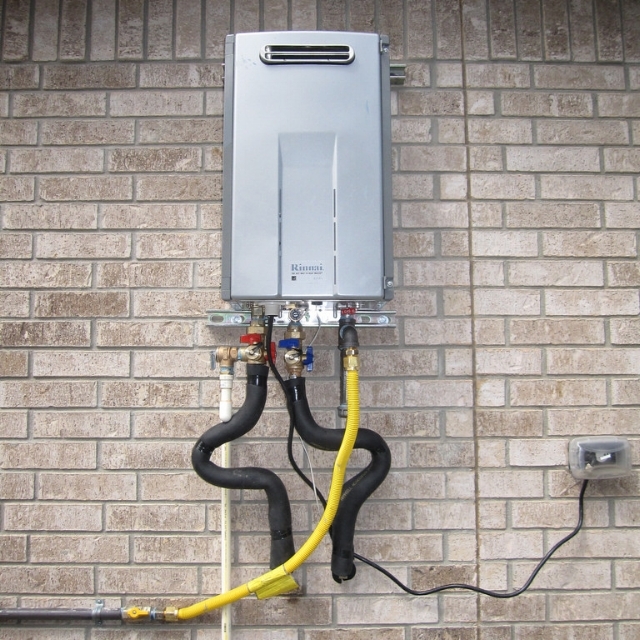 Installation of a tankless water heater is a skilled service. A savvy homeowner or even an untrained plumber will not have the skills necessary to install a tankless water heater. Tankless use 30-50% less energy than tank units. Depending on the cost of the current water heater, this could offer substantial savings. However, the system requires yearly maintenance by an authorized service rep, a charge which, combined with the higher initial cost, should be considered. Tankless water heaters can be installed on the wall or outside in warmer climates, as they can automatically warm themselves. In-wall or outdoor units can be a space saver. Venting can be done either through a roof or a wall, unlike traditional gas water heaters, which have to go through the roof. If you’re considering the purchase of a tankless water heater, understanding these pros and cons can help you make a more informed decision.